Don Tapscott organizes some of the Harvard Business Review's most insightful articles into a framework for understanding the new dynamics of value and wealth in the networked world. 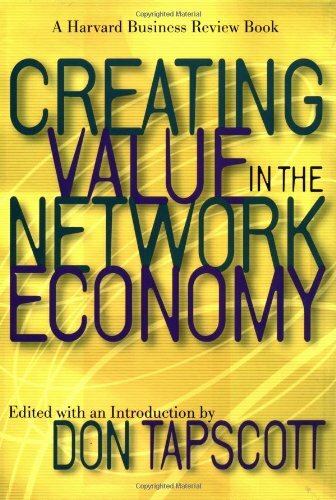 A rich mix of ideas and insights, Creating Value in the Network Economy explores all aspects of the interconnected business environment, from the importance of trust in the virtual organization and the changing nature of customer relationships to new ways that companies can generate returns from their intellectual assets. The real-world examples from companies such as Amazon.com, eBay, The Wall Street Journal, and Auto-by-Tel help managers to see more clearly the opportunities for transfiguring their business around the Internet. Most corporate leaders recognize that today's increasingly wired world is dramatically changing the way they conduct business. Only a precious few grasp exactly what this means to their own operations, however, and fewer still have implemented appropriate strategies that put them ahead of the curve.